Cowboy Bebop Wallpaper: Dead & Gone. 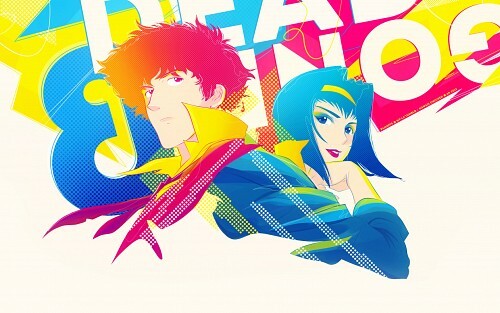 Minitokyo »	Cowboy Bebop Wallpapers » Cowboy Bebop Wallpaper: Dead & Gone. Originally the characters outlines + some coloring were done in Photoshop 6 (I use PSCS6 atm) and I feel like the quality/size kind of suffered for it. A couple weeks ago I loaded the psd, cried, proceeded to try to salvage some of the pixilated outlines and then went from there. In the end I scrapped the original concept (idk Spike had green hair in the original wall? Idk wth I was thinking back then.) and redid the whole composition + color scheme. Everything was done by "hand" (tablet) via CS6, with the exception of the outlines. I obviously went cray cray with the details, I had some type of determination while making this. The title is from a Black Keys song. Ik this isn't the greatest ever but in the end I decided to submit this bc the accumulating guilt was too much to bear. *shrug* Hope some of you like blinding saturation tbh, ahahaha. Welp, that's the end. This took me longer to write than it should of tbh, I'm too used to html now. Ty 4 ur time. Wow. Pop. That was what I said to myself when I saw your work. Personally I like graphic design composition and your work has really brillant / bright colors that I loved. I like how is big and cut the big write behind with its 3D effect and random color lines. My most fav. detail is Fey's make-up, with its shade on her eyelids. Using pois for some parts it was a great idea, to different directions, because they give an amazing Pop Art reminding execution. Well, I hope this work could finish in Highlight Gallery because its so damn good. Absolutely added on my favs. My compliments. Nice to see you here kawaii Pam. your colors are so awesome always and so is your design sense. The thumb drew me to it immediately. Great work. love the funkiness of it all ! I'm a big time cowboy bebop fan and you seriously did some love to it. great job ! I love this wallpaper! I really like how you've swapped the stereotypical colours around, so instead of blue for a boy and pink for a girl you've made Spike pink and Faye blue. Great job! This is the first thing I've commented on since forever ago. I'm loving the colors and patterns! Great job!